NOTICE: Activation key must be used on a valid Steam account. 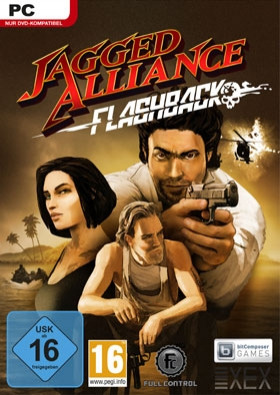 Requires internet connection.ABOUT THE GAME Jagged Alliance: Flashback brings back the soul of the series: turn-based tactics meet unique mercenaries in an intense strategy battle. Rise to the challenge and lead the rebellion of San Hermanos to victory by defeat ing the evil Prince.The key to victory lies in good planning and intensive … preparation!Make use of the complex game features offered. Assess the situation, allocate your resources and assemble your team. Recruit mercenaries, train them and infiltrate the island enemy by enemy, sector by sector and free the people from the dictator.Don’t just witness the founding of the legendary mercenary organization A.I.M.-be part of it!KEY FEATURES A complex game mode: plan and assess your moves on the Strategic Layer in 50 zonesand enter each one on the Tactical Layer. Assemble your squads from over 25 unique mercenarieswith unique preferences, advantages and weaknesses. Every character counts! If he dies, he will be lost for the rest of the game. Training-and skill system for the mercenaries-> Marksmanship, Medicine, Mechanical, Explosives, Melee, Stealth. Manage over 30 different weapons and more than 60 items. Be part of the formation of A.I.M. Create and defend captured zones and train militiato make sure that the enemy doesn‘t take them back. Build our own maps, quests und campaigns and share them directly on Steam Workshop.-> the possibilities are endless!SYSTEM REQUIREMENTS Minimum:Windows: OS: Windows 7 Processor: Intel Core i3 or AMD equivalent Memory: 4 GB RAM Graphics: Intel 4400 / AMD HD 6670 HDD: 5 GB available spaceMAC: OSX 10.6.0 Processor: Intel Core i5 Memory: 4 GB RAM Graphics: Intel HD Graphics 5000 HDD: 5 GB available spaceLinux: OS: Ubuntu 13.04 Processor: Intel Core i3 or AMD equivalent Memory: 4 GB RAM Graphics: Intel 4400 / AMD HD 6670 HDD: 5 GB available spaceRecommended:Windows: 0S: Windows 7 or Windows 8/8.1 Processor: Intel i5 or AMD equivalent Video: Nvidia GeForce 600 series or AMD equivalent RAM: 8 GB RAM or higher HDD: 5 GB available spaceMAC: OSX 10.9.0 Processor: Intel i7 or AMD equivalent Memory: 8 GB RAM Video: Nvidia GeForce 700 series HDD: 5 GB available spaceLinux: OS: Ubuntu 13.04 Processor: Intel i5 or AMD equivalent Video: Nvidia GeForce 600 series or AMD equivalent Memory: 8 GB RAM or higher HDD: 5 GB available space Jagged Alliance: Flashback © 2014. Jagged Alliance is a registered trademark of bitComposer Entertainment AG. Published under license to Full Control ApS. All other trademarks are the property of their respective owners. All rights reserved.